This post is especially dedicated to my son Arun, a foodie through and through right from the day he started on his solid food as a baby. He learnt to switch off the gas stove even before he could properly learn to stand upright lest walk without me teaching him. His biggest plaything used to be my 10 liter pressure cooker. It would be so hilarious to watch him carry the cooker body which would be heavier than him. This happened last week when Hubby called me at work to pick my MIL from the station who was visiting briefly for a Doctor Check-Up as he was held up in a meeting. As the call was a last minute thing I had to rush to pick up my kids from the practice sessions at school, dropping them at home before heading to the station. When I returned home with her what hit me first was the smell of bread being toasted wafting thru the air. I was quite shocked to know that as both the kids were feeling very hungry Arun had switched on the stove and has toasted bread all on his own. I did not even know that he knew how to go about it. His “Avva” (Grandma) was mighty impressed with his kitchen skills. 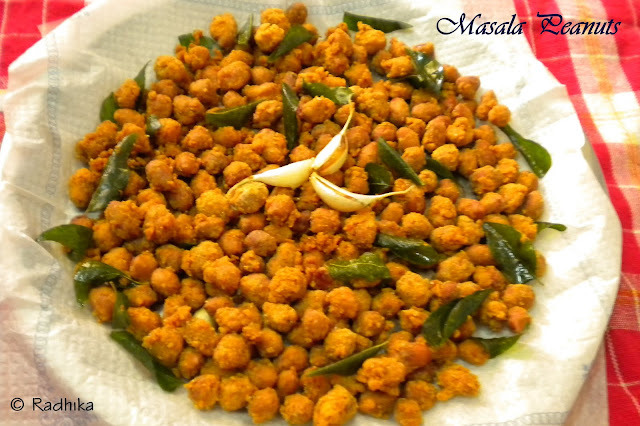 After knowing that she had brought peanuts I wanted to make Masala peanuts to munch on while watching the IPL. When he volunteered to deep fry them all on his own I was totally against it. But he was quite insistent that as I had big Jaali spatula he would be O.K and wanted to learn it after promising me that he would never attempt any deep frying on his own without my presence. Presenting you our family’s favorite Match and Movie Muncher done my Son. The Clicks too are by him. Heat oil in kadai. In a vessel combine the peanuts and water and mix well. The peanuts should be fully wet. In another vessel combine together gram flour, rice flour, chilli powder, asafetida, baking soda, salt and food color if using. Mix well. Add this to the wet peanuts and mix well. The flour mixture should coat all the peanuts completely. Add the curry leaves and the whole garlic cloves to this and mix well. Spread the flour covered peanuts into the oil and fry till golden brown. Take care as the curry leaves may splatter. Drain on a kitchen napkin and let it cool completely. Sprinkle the chat masala powder if using and toss well. Store in an airtight container and munch on while watching movies and matches. Note: Do not add water after mixing the flour with the peanuts as it will become lumpy. I have used home made flours in this recipe. I have not added any food color. You can avoid adding curry leaf and garlic but do so for its amazing flavor. 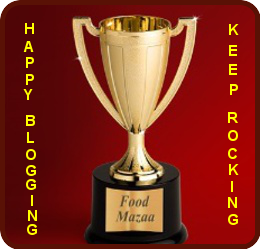 I would love to share this with Shobha of Food Mazaa for being such dear to share this lovely award with all her blogging friends. Hugs to you. Very inviting munchies, superb spicy. wow so yummy and very inviting !! Loved them !! What a coincidence. I just did masala peanuts yesterday but did the baked version. Great to know about your son…I hope my daughter also shares my cooking passion once she grows up. And who would love to munch on these cuties. Looks so crunchy munchy. 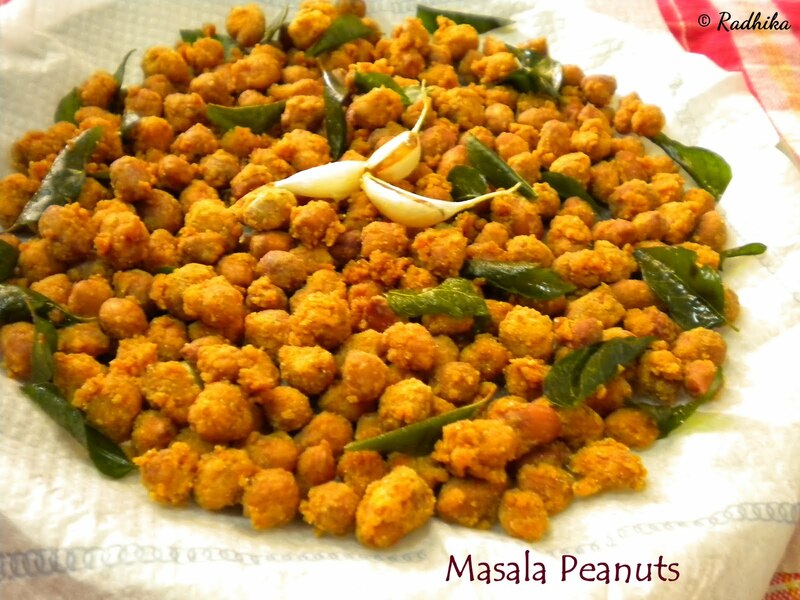 Spicy and irresistable masala peanuts..
Masala Peanuts look so scrumptious. I love this so much but never tried making this at home if little Arun can make this so well I think I can make this too.The pictures of the peanuts are so good even better than some of mine.Do congratulate him on work so well done on my behalf.And thank you dear for linking this yummy munchies to my event. 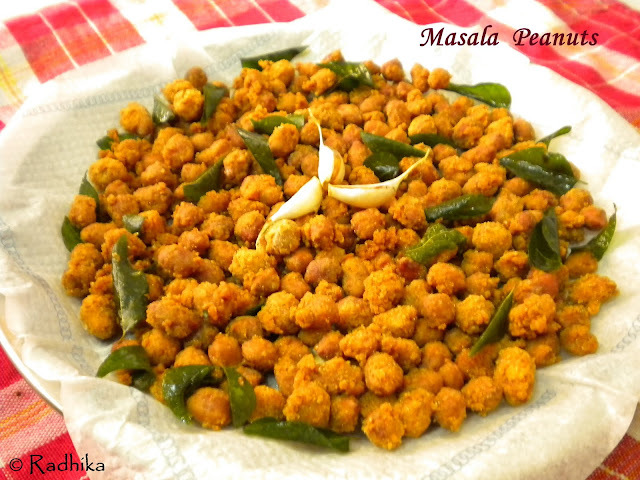 Crispy masala peanuts tempts me a lot,havent prepared since a long,simply inviting.. This is one of my childhood snacks…Lovely blend of spices in it! 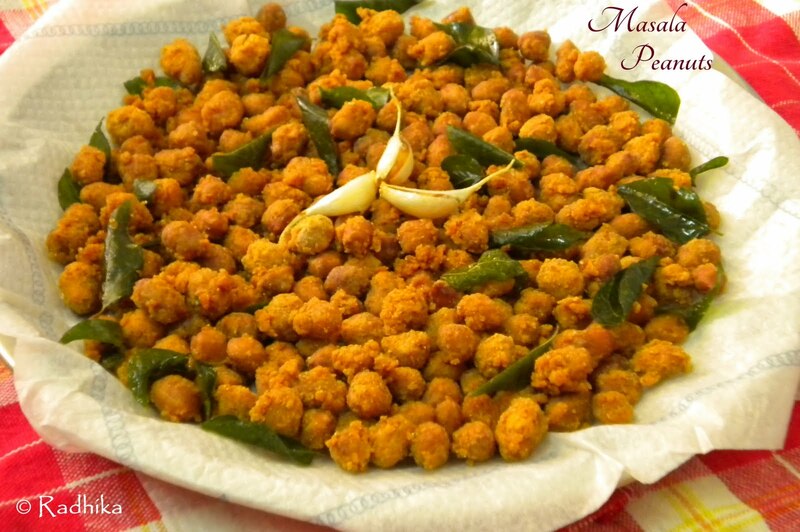 Masala peanuts looks awesome delicious. Appa used to buy for us. Wow mouth-watering masala peanuts,looks so yummy. Perfect…so tempting, they look absolutely crispy and delicious. LOOK SO GOOOOOODDDD! LOVE this – could eat all of it!